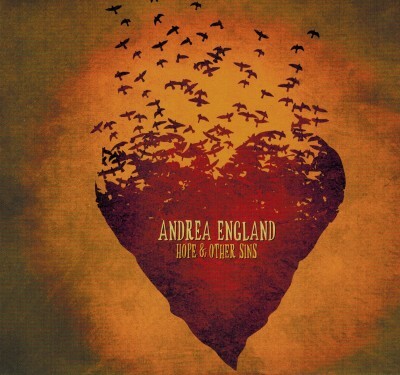 Andrea England, pop singer/songwriter from Nova Scotia just released her sophomore CD entitled, Hope & Other Sins in June 2012. A full 7 years after her debut album, she won the John Lennon International Songwriter prize and acknowledgments from the USA International, OCFF and NSAI songwriting competitions, Music Nova Scotia and the Toronto Independent Music Awards. Andrea recovered from a 1999 car accident and continued her incredible songwriting. She is a songwriter first and has 140 compositions and counting and has collaborated songwriting with some of the best songwriting professionals. So fans are in for a treat with this new album. The CD was produced by Colin Linden and recorded in Nashville, USA. Some of the guests appearing on the album were: Bruce Brody, Carolyn Dawn Johnson, Damhnait Doyle, Dan Dugmore, Gordie Sampson and Liz Rodrigues. The CD jacket contains words to all 10 songs on the CD, all musicians who helped with the CD and all acknowledgements to those who helped in production of the CD. Atlantic Seabreeze gives this album good ratings on itsn rating list and viewers can go to Andrea's website to find out more information regarding her music, address posted above.